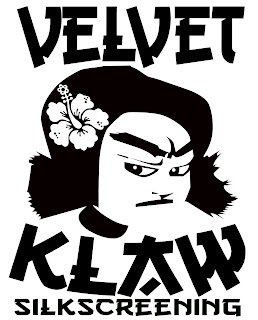 We are sad to announce that the Velvet Klaw Studio is now closed. The VK studio had to shut its doors this week to to unforeseen circumstances. We had a great (almost) 2 year run at the NTC in Liberty Station, but now it's time to move on. We are still printing shirts, bags, etc., so if you are interested in learning more about our hand screening services, drop an email to: info@velvetklaw.com . You can also find us at all San Diego North Park Craft Mafia events too!